I wanted to let you all know about a new book by Dino Senesi that has recently come out. Underscoring the importance of coaching for church planters, Sending Well strives to answer the question, “How can we consistently deliver great church planter coaching to every church planter in North America?” After covering the basics of a coaching platform and what that looks like, he unpacks the 10 qualities of a great coach, which creates a clear and simple target for coaches to continue growing toward. Then Dino lays out a delivery system to provide that coaching. In the many years I have known him, Dino has grown deeply in his understanding of both church planting and coaching. He knows what he’s talking about. 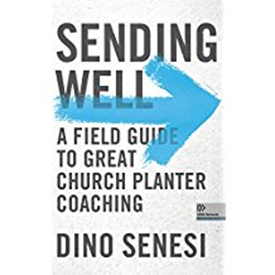 If you want to learn how to create and deliver a sustainable and scalable movement of coaching for planters in your organization, Sending Well provides you with the blueprint. It’s a privilege to recommend this book, and I am confident it will be a blessing to many.